UNO - Headers on Digital Side - Intentional? > UNO - Headers on Digital Side - Intentional? I've been toying with the UNO, and decided to try a perf board with a header. 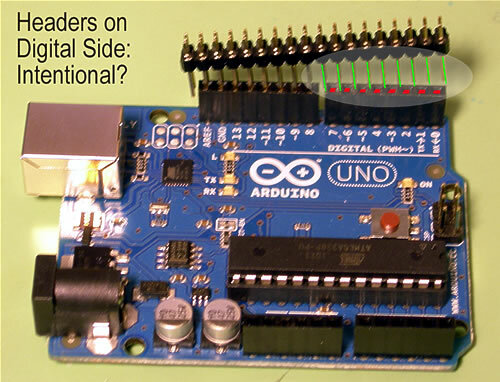 When I tried to match them up across the length of the arduino with the result showing in the image below. I've highlighted the problem, showing how the pins in green don't match the holes in red in an attempt to use a header across the entire array. A standard header does match up with one pin fitting loose in the gap between the power and analog arrays. I cannot believe digital array would be intentionally hampered, but I'm new to this, so I have to ask. Is there supposed to be a gap that disallows the use of a standard header and perf board? I got this one from NKC Electronics. Should I ask for a replacement? Re: UNO - Headers on Digital Side - Intentional? Its actually the pins 8-Aref block that are out of position, the ones you've highlighted are aligned with the pins on the other side of the board. Think of it as finding a misspelled word in the U.S. Constitution. Minor screw-up, but it would take 2/3 passing in congress, presidential signature, and 2/3 of 50 states approval to correct it. If you'd like to make your own shield, you may want to start with the Eagle files for an existing shield. Note that the space between pins 7 and 8 is not the standard 0.1". Commons-proprietary - adj. - a small non-standard intentional design flaw made in open-source hardware created for the sole purpose of growing an economy around the same hardware. Usage: "Does Arduino use commons-proprietary hardware?" Whether that original 'brain fart' was intentional or not, Arduino certainly has built a thriving community of small and growing businesses. That's a good thing, right? Are there any suggested workarounds other than wire leads from the arduino pin sockets and then soldered to the perf board if you're using something small like this? Thanks for your replies. These are both excellent workarounds. I admit, until I get a drill press, I'm likely to go with the offset header fix.